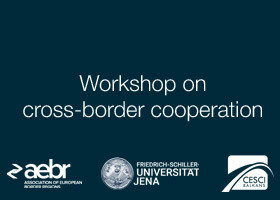 CESCI Balkans and AEBR Center for Balkans in cooperation with the University of Jena organized the Seminar on Cross-border cooperation. The Seminar held on the 28th of July was organized for students from the Faculty of Political Science at the University of Jena. Dr. Ksenija Crnomarković, Department of Political Science. Lecturers at the Seminar were: Ms. Ana Nikolov, AEBR coordinator for Balkans and Mr. Ervin Erős, Director of CESCI Balkans. After the Seminar, the discussion led to the creation of the Programme for the European Winter School on Cross-border Cooperation.